"This chicken is quick, simple, delicious and has an elegant presentation! If you don't have prosciutto handy you can use bacon. Make it really special and throw in a variety of exotic mushrooms, shiitake, portabello, oyster, etc. It can be prepared ahead of time and thrown in the oven when ready. Serve with garlic mashed potatoes, buttered noodles or basmati rice." Drizzle butter into a casserole dish. Season chicken with salt, pepper, and 1 tablespoon garlic. Wrap chicken thighs in prosciutto, and place in casserole dish. Sprinkle mushrooms and remaining garlic on top of chicken. Bake in a preheated oven until juices run clear, about 1 hour. Remove chicken to a platter, and cover with aluminum foil to keep warm. Pour drippings from casserole into a skillet set over medium-low heat. Whisk in wine and sour cream, and cook until warmed through, about 5 to 7 minutes. Pour over chicken, and serve. 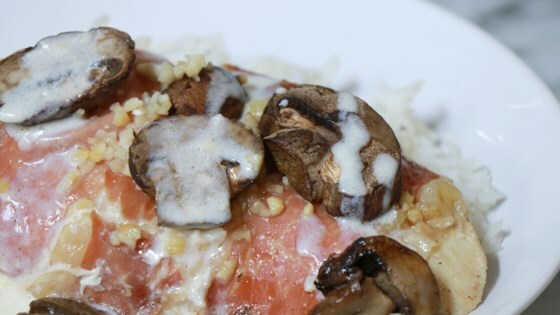 A fancy and flavorful chicken dish with cream sauce.